Hello loves! It's finally Saturday! This week was so long and busy that I haven't had time to post much. I'm also behind on the holiday nail art, but I'm happy to announce that I made some tutorials today, which I will be posting next week. So stay tuned because fun things are going to happen! Today I want to show you a manicure I did a couple of days ago. I wanted to create a snow effect so I've used a white polish (Farmec 50) and on top of it I layered one coat of ELF Twinkle (multicolored glitter). Here's the result. I purchased Farmec 50 last week, in my quest to find a good white polish. 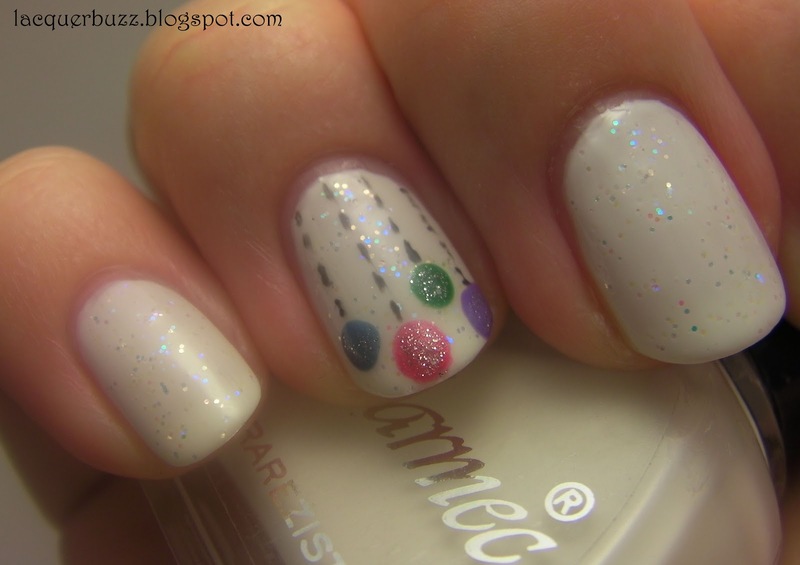 Unfortunately, this is very sheer, so it can't be used for stamping and requires 3 coats for opacity. Even then, some visible nail line is present in brighter lights. What I like about it is that it's not chalky at all and it dries very fast. I also didn't experience any chipping or tip wear in two days of wear. After applying this, I decided to do an accent nail with a design I've been thinking about for some time now: Christmas ornaments. For this design, I've used a large dotting tool and a very thin brush. The polishes for the ornaments are, from left to right, Essie Coat Azure, Body Collection unnamed red, OPI Don't Mess with OPI and Sephora Let's Dance. On top of the ornaments, I've put some ELF Glitter Glam nail polish to make them sparklier. The strings were painted using Moyra 35 (black). 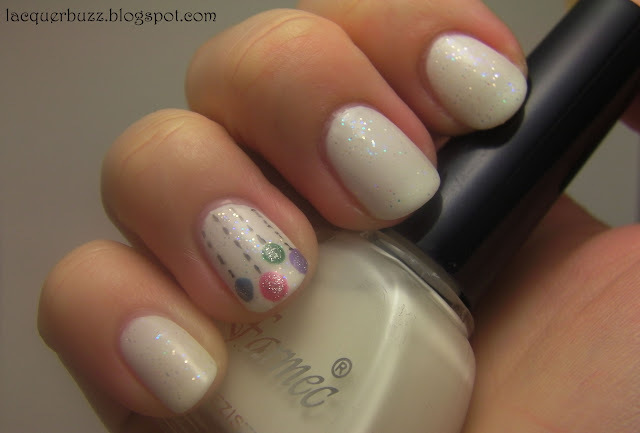 I've tried to do this on my other ring finger too and realized I can't do anything with my right hand (not even dots). I have to start practicing more because it's really annoying not to be able to do the most simple nail art on my dominant hand. 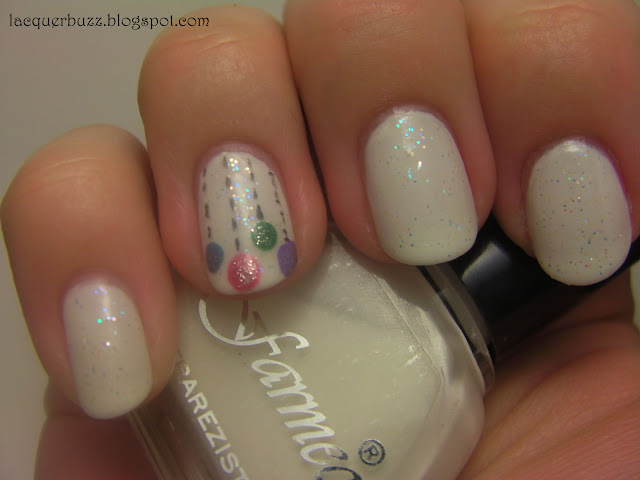 I hope you liked this mani and don't forget that exciting stuff is coming next week! Have a nice week end! @Marisa Can't wait to see! @Boarbb Maybe if you tried to layer something on top. Orly has a new shade called Au Champagne. It's a shimmery white that is more wearable than other whites. You should check it out on the blogs. I really love this; it's so pretty and sweet. So pretty and feminine! A different approach to white, I like it!